Happy Monday! I'm back with another post. I wanted to share with you some pictures from about a few months ago. I participated in a community service event for my friend Melissa's charity organization Glinc. They mentor a group of Latino youth at a local high school and prepare them for college and the career field. I had the opportunity to teach a seminar on professional makeup. I've actually already done a video on how to wear a professional look for a job interview. Check it out! I went over the same principles with the class. There's a time and place for everything. I was teaching them how to have a polished look for an interview. The key is to look awake, neat and ready to win the job! Save the dramatic liner and shadows for going out at night. Here I am demonstrating the look on my model. We actually held the class in the school library, lol. Always choose a neutral lip color that's not too shiny. I chose a mauvey shade close to the girl's skin tone. I think the girls enjoyed it. After the demo, I did a quick makeup session with each girl. 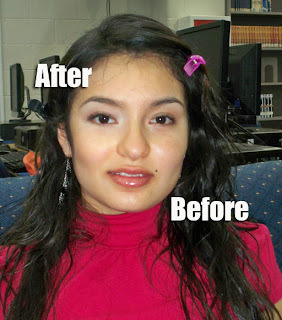 I shared with them quick tips like how to apply eyeliner, and to try using a primer to control oily skin. In this picture the guys in the group are in the back left, learning how to tie neckties, he he. I did a demo on one of the girls in the group. The left half of the face has the polished makeup look. You can see that it's not too dramatic but it just makes her look a bit more clean and professional. If you're a makeup artist, it's always good to use your skills to give back to the community. Or let's say you're just a beauty junkie that's good at makeup...why don't you teach a younger friend or cousin some tricks you've learned along the way. It really does make a difference. Hi Ren, i totally agree with you on the using your skills to give back part. Was already thinking about something along those lines. Nice work you got going. We are thinking of doing something just like this for seniors in my town too! Great minds think alike! perfect idea: the culture always brings to our society and the expectations are growing for the community, better opportunities and increasingly, more people that consider their ideas for improving our systems. But for the society we live to help us decide and make the best decisions to achieve a desired victory together. A city can not change from one day to another but if we can grow our cultures and capabilities to improve where we live. For example with this type of projects that promise to enrich us and give us more than we already have. It was totally so cool! I think you are a good presenter by just looking at the picture.